Formed in 1969 and originally known as the Sheffield Sunday Sports League, the League has developed to become one of the top adult Sunday football leagues in the Sheffield & Hallamshire County FA area and possibly the country. More recently the League's reputation as one of the most progressive was further highlighted by it becoming the first male adult Sunday League in the County FA area to sign up to the FA's Respect campaign and in 2012 were awarded The FA's Bronze Award for its work towards the aims of The FA's Respect campaign. Since it started, the League has been sponsored by a number of local companies, but we believe it to now be unique in that it is sponsored by one of the country’s top professional football clubs, Sheffield United. The sponsorship is through the club’s Promotions wing, Blades Super Draw, and as well as financial incentives for clubs and tickets for games, the package also sees the League's Cup Final staged at the Blades' famous Bramall Lane stadium. The League Cup competition, currently known as the twentytwo Cup is sponsored by the local sports company twentytwo. As well as the Blades Super Draw and twentytwo sponsorships, local football equipment company Sheffield Trophy Centre are sponsors of the Leagues Leading Goalscorer Award and the League's CBC Premier Division is sponsored by CBC Computer Systems. CBC also sponsored the League’s prestigious monthly Merit Awards, while Angel IT Solutions are the sponsors of the monthly Peak Performer Awards and it’s through these monthly awards that many celebrities from football, entertainment and beyond have been associated with the League. 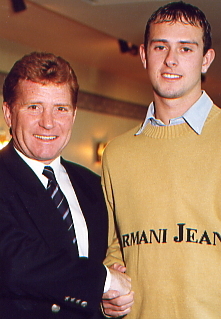 It was fitting that in 1987 the first presenter was the late Derek Dooley and his support to the League was crucial in The League's development. Former Blades boss Bryan Robson and his assistant Brian Kidd are among the other presenters, while their mentor, the Manchester United manager Sir Alex Ferguson, has presented the awards three times. Four previous England managers, Kevin Keegan, Glenn Hoddle, Terry Venables and Graham Taylor have also done the honours. 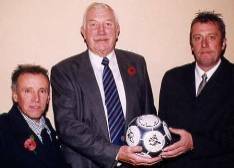 The late John Charles CBE, the former Juventus and Leeds United star has also presented the awards and John, the 'Gentle Giant' was also the League's honorary Vice President, but he's not the only 'all time great' to have done the honours. 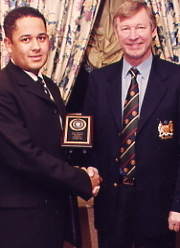 Among the many others to have presented the awards are World Cup winners Jack Charlton, Alan Ball, Gordon Banks, Nobby Stiles, Martin Peters and Roger Hunt, while other world famous stars include George Best, Kenny Dalglish, Denis Law, Jimmy Greaves and Sir Stanley Matthews as well as Brian Clough. 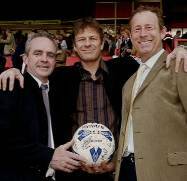 Other past and present Premiership managers to have done the honours include Dave Bassett, Graeme Souness, George Graham, Ray Wilkins, Joe Royle, Jim Smith and Roy Evans, but not all the presenters have come from within football. Hollywood star Sean Bean, Donny Osmond, David Essex, The Monkees, rock and roll legends The Crickets and former Monty Python star Michael Palin have all done the honours, while the awards have even received royal approval when HRH The Duke of Gloucester presented the award to Handsworth Old Boys.